Myths and mysteries of Mount Kilimanjaro — Just Kilimanjaro (T) Ltd. Covered in mist, full of legends and mystery, Mount Kilimanjaro (otherwise known as the roof of Africa) stands to attract tourists from all corners of the world, the reasons behind its nomination to contest for listing in New Seven Wonders of Nature. Shrouded in gray, dark clouds and covered in mist most of the day, Mount Kilimanjaro with a height of 5,895 meters is located some 330 kilometers south of Equator, giving an awesome and magnificent inspiration hundreds of miles away. Kilimanjaro is one of the leading single and freestanding mountains in the world, and it composed of three independent peaks of Kibo, Mawenzi and Shira. The entire mountain area is 4,000 kilometers of the earth surface. When Mount Kilimanjaro is Africa's jewel today, earlier occupants of its slopes took this glorious and glamorous mountain to a place on not going in fear of reprisal from God because it was his almighty seat. And locals today see the dwindling snow as a punishment from God because too many humans attempt to climb it everyday. Tourist deaths on the mountain are as well, connected to wrath from God. Uncounted stories, thousands of myths and legends are told about Mount Kilimanjaro. Locals on the slopes, the Chagga people, are telling us of pygmies said to be no larger than human children, and who dwelt on the mountain's caves and ravines. These ravines, which have never been explored by tourists, are said to have been inhabited by mountain pygmies who survived by hunting and gathering. During dry seasons in the past, locals blamed the mountain's demons for taking away the rain, but when the rain was too much, they turned their faces to the mountain, bowing, asking God to forgive them. Adding to the mystery of this highest mountain, there, probably dozens of names to mention it, as it remains a puzzle today. For the local Chaggas, the name Kilimanjaro does not belong with their history or legend, it does not mean much although it's the most famous name to foreign visitors or others from far away. They don't have a collective name for this majestic mountain, they have two separate names. They call the highest peak "Kipoo" or Kibo and the shortest peak "Kimawense" or Mawenzi. Germans named the mountain "Kilimandscharos," though nobody knows where the Germans got the name. Some argue that it could have been a contraption from wrong pronouncement from the Chagga's expression "Kilemeiroiya," meaning not easy to climb on. It is also believed that the present name of the mountain was derived from the Swahili people from Mombasa and other coastal towns who called it "Kilima Njaro," or mountain of caravans, because they used the mountain as the symbol to determine directions form far away, as their compass. Although mentioned in African legends, the earliest written records of the mountain date back to the second century when a Greek geographer Ptolemy from Alexandria in Egypt wrote about the land beyond "Opone" and the great snow mountain in Rhapta. Opone, according to Ptolemy, is the coastal part of Somalia and northern coast of Kenya, and Rhapta is the big landmass or the great East African massif where Mount Kilimanjaro is part of this, huge landmass. Mount Kilimanjaro had been thought to be the source of River Nile and a Mountain of mystery - the mystery being a snow capped Mountain in Africa. Africa was thought to be a continent of savages, thus stories about the continent were often down played. With colonization came European missionaries, who traveled inland to preach their religion. 1n 1846, Dr. Ludwig Krapf and Johann Rebmann landed at the coast of Kenya and set up a missionary at Rabai, close to the town of Mombasa. In 1849, both Krapf and Rebmann confirmed their sightings of the great Mountain. Rebmann saw the mountain from his camp at Taveta in Kenya. Reports about the mountain were received by the Royal Geographical Society, which prompted a great debate about the accuracy, about the height and possibility of snowcapped mountains in Africa. 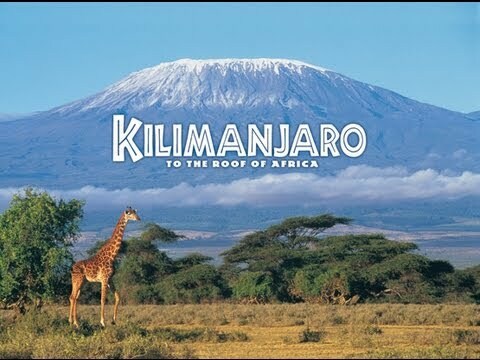 On October 5, 1889 that German Geologist succeeded to reach the Kibo peak, the highest point on the African continent. He named this loftiest spot in Africa Kaiser Wilhelm’s Peak. Retired Tanzanian army, General Mirisho Sarakikya is the known Tanzanian to have climbed the mountain 38 times in his annual pilgrimage to the rooftop of Africa. The General saw this majestic mountain as the only natural laboratory and a therapy for unknown diseases. "If you manage to reach its peak, then, be assured of your body fitness, you are physically fit. When you have a health problem, the climbing exercise will detect it and you will not reach the top point", the General said. The oldest Mount Kilimanjaro climber known today is an 84 year old American tourist, Mr Richard Byerley from Washington state who has broke the record to become the oldest person to reach the peak of Mount Kilimanjaro recently. Byerley had his name entered the Guinness World Records as the oldest known climber to reach the highest peak in the African continent. Mount Kilimanjaro represents the worldwide image of Africa and its towering, snow capped symmetrical cone is synonymous with Africa. Internationally, the challenge of learning about, exploring and climbing this mysterious mountain has captured the imagination of people throughout the world. To many, the chance to climb this mountain is an adventure of a lifetime. Tanzania will mark 50 years of independence next month with a symbol and pride of Mount Kilimanjaro as its tourist, social and political brand mark. This African highest mountain has been listed among twenty-eight leading tourist destinations in the world nominated as candidates for voting into the New Seven Natural Wonders of the World.